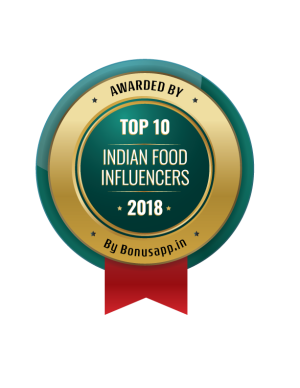 I am surprised at myself for not having shared some typical Punjabi recipes that are made unfailingly in almost every Punjabi household such as Gobhi Aloo, Palak Paneer (Spinach Cottage Cheese Curry) and Rajma (Red Kidney Beans Curry). Well, it is never too late to share good old recipes. So, moving on with the list of recipes that I am sharing under the series of Everyday Indian Recipes, gobhi alu is here to say hello. It is hard to say that all the recipes that I am sharing or those that I have already shared here are authentic or not coz every family has its own way of cooking/ making their favorite curry. For instance some people fry the cauliflower before adding it to the masala while others prefer cooking it with the masala. Apart from basic fundamentals, I guess there are not (and should not be) fixed rules as to how to make a curry. It is all about how we enjoy our favorite dish. For instance, those who eat their curries with rice, add water to their cauliflower curry which is almost like blasphemy for a Punjabi! 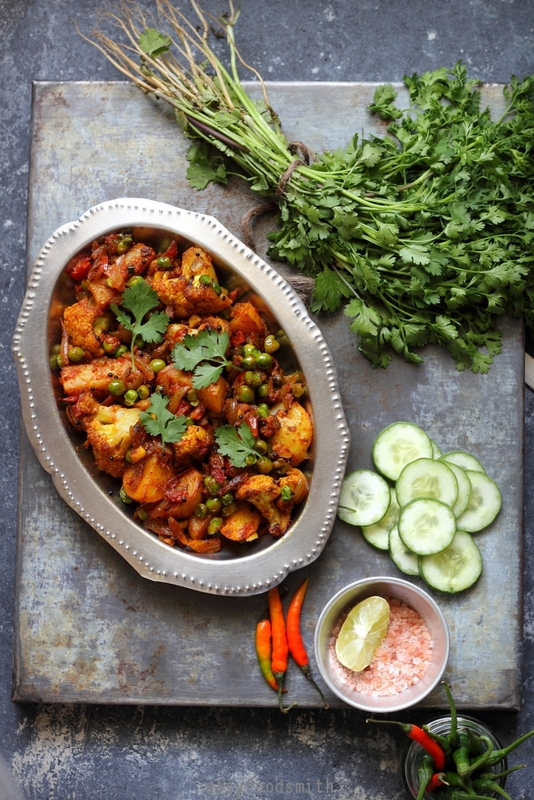 Adding water to gobhi is unthinkable for many. But those who like it that way cannot imagine of eating it in any other way! So, break the rules and cook how YOU enjoy your food and not how it is ‘supposed’ to be cooked. Break the cauliflower into florets and wash it well. Drain water and keep the cauli aside. Peel, wash and thickly slice the potatoes. Set aside, submerged in water. Slice the onions (not too thin) and chop the garlic. Set them aside. Wash and finely chop the tomato. Set aside. 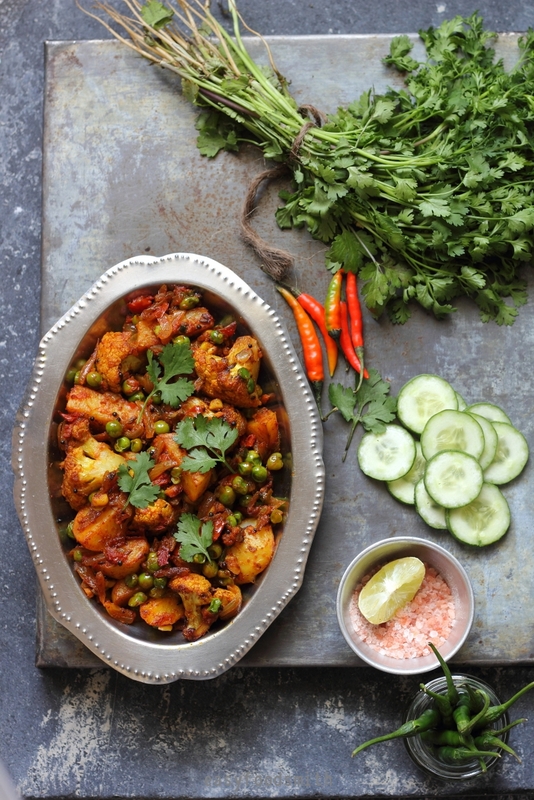 Heat oil in a wok (kadahi) or a pan and fry the cauliflower till it turns golden. Remove on a absorbent sheet. Now add potatoes to the oil and fry till the potatoes turn golden brown. Remove on an absorbent sheet. In the same oil, (add more if required) add the cumin seeds, mustard seeds and fennel seeds. Once the seeds begin to crackle, add the asafoetida. Add onions along with ginger and garlic. Stir fry till they turn golden in color. Add the salt, chili powder, turmeric powder, coriander powder and garam masala. Remove in a serving bowl and garnish with finely chopped fresh coriander leaves. 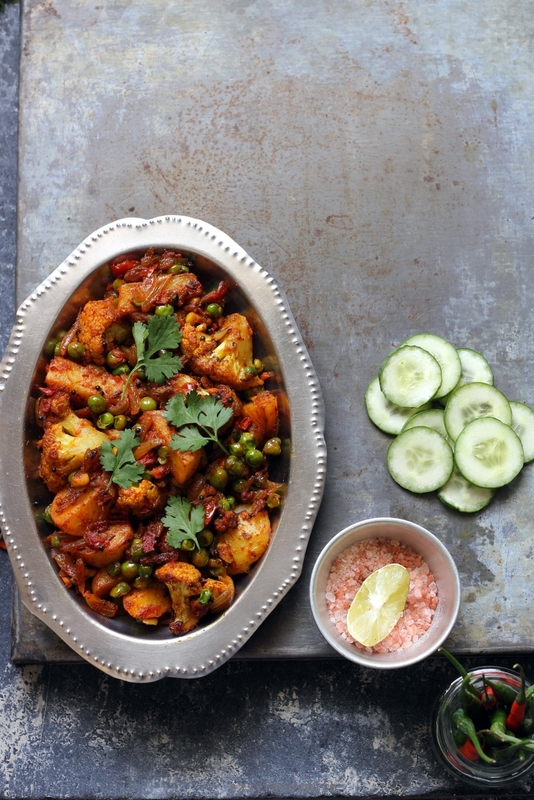 Note – Feel free to alter the ratio of potatoes and cauliflower in the curry. Note – Frying the potatoes and cauliflower separately is an optional step. If you do not want to fry them, add them straight away after you add dry spices. Thanks for your visit and see you soon again with another exciting post! What an absolutely beautiful looking curry! 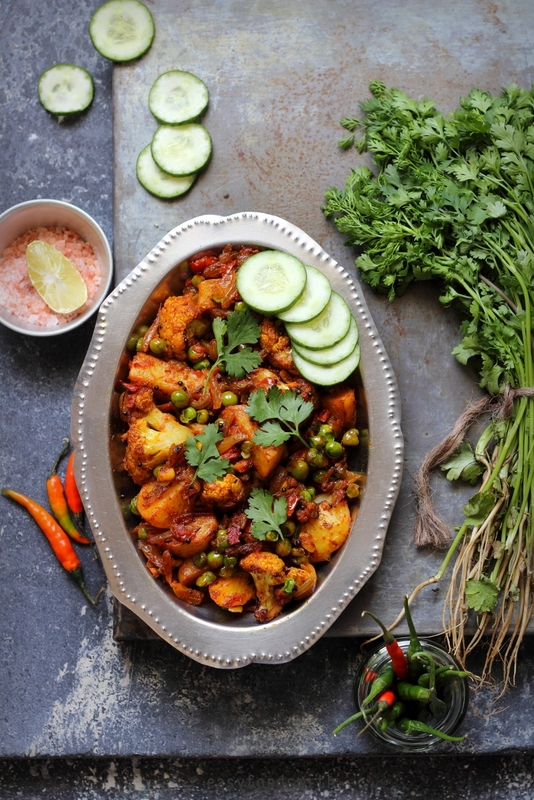 I always make a curry on a Sunday for my wife and I. I’m bookmarking this and all your other recipes to study further!